Each test has at least 10 latent prints and a varying number of tenprint known cards and known palm cards. HOW IT WORKS: Purchase your downloadable proficiency test and we will send you an email on distribution day with login credentials and download instructions. Simply, login to our secure download portal where you will find a test instruction sheet PDF, known images, and latent images. You now have everything you need to complete your proficiency test. Each downloadable image file will be provided in JPEG 2000 formats. The original latent print images have been captured at 1000 ppi or higher, and all of the livescan prints are captured at 500ppi. The latent print image is printed using high quality industry leading printers which accurately renders a 1,000 ppi image. We are able to provide this extremely high level of quality due to our significant investment in the latest printer technology. Our digital images are a great option for the examiner who is completing their examinations on-screen. The latent images provided on DVD disc have been captured at 1000 ppi or higher. Each image is provided in a .tiff format. A professional photo editing software is highly recommended. Images contained in the sample document are not comparison quality images and do not accuratley represent RS&A production test images. 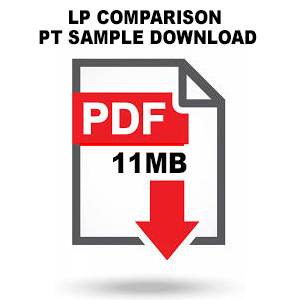 Latent Print Comparison Proficiency Test images are rendered at 1000ppi using the highest quality printers in the industry.